Like many BBQ sauce, salsa, and hot sauce producers, Matt first started the Hot Wachula’s company after friends and family said he would do well with his Peach Salsa. It didn’t take long for Matt to earn some choice retail shelf space at various groceries and other locations. In addition to his Peach Salsa, and other hot sauces, he makes one hell of a good Black Bean and Corn Salsa. 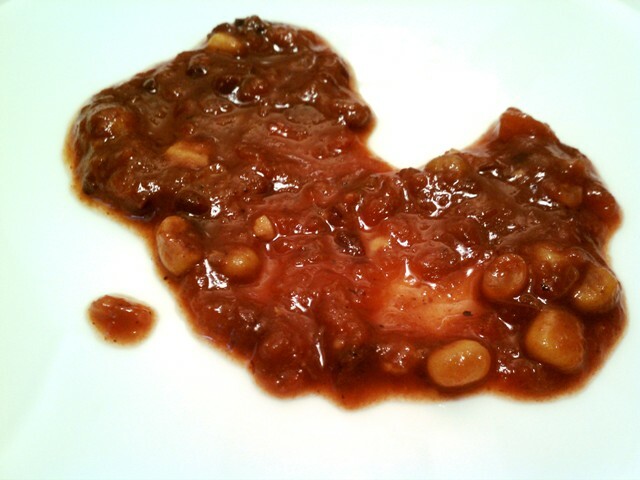 While I could provide some great feedback on many of Matt’s products, this post features the Peach and Black Bean and Corn salsas, my personal favorites. 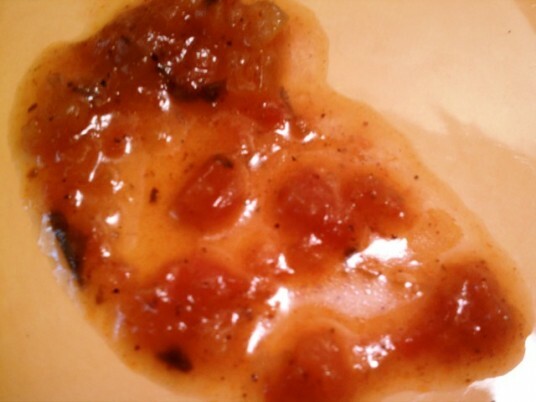 When many folks think of fruit-based salsas, they normally expect a medium to high amount of sweetness. This is not the case with Hot Wachula’s Peach Salsa, which is made in small batches with fresh, natural ingredients. Matt’s done a very nice job of creating a medium heat profile of onion, garlic, jalapeno, cilantro and other spices, while allowing the peach notes to sort of hang out and enjoy the ride on your taste buds at the top end. As you can see from the photo above, this salsa’s ingredients are chopped into a relatively fine yet still decipherable mix. On a thickness scale of 1 to 10, I’d rate this at a 6. I like to play with my food, as this photo shows. What I’ve done is put a bit of whipped cream cheese on top of an all natural blue corn tortilla chip with a daub of Matt’s Peach Salsa on top. The base of the blue corn and sweet creaminess of the cream cheese really sets up the vegetal spicy sweetness of this salsa. You should really give it a try. 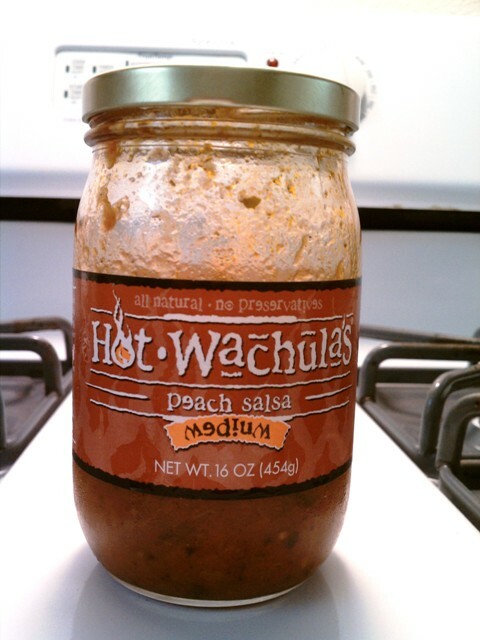 Note: For those of you like less or more heat, you can get this Hot Wachula’s Peach Salsa in mild, medium, or hot varieties. 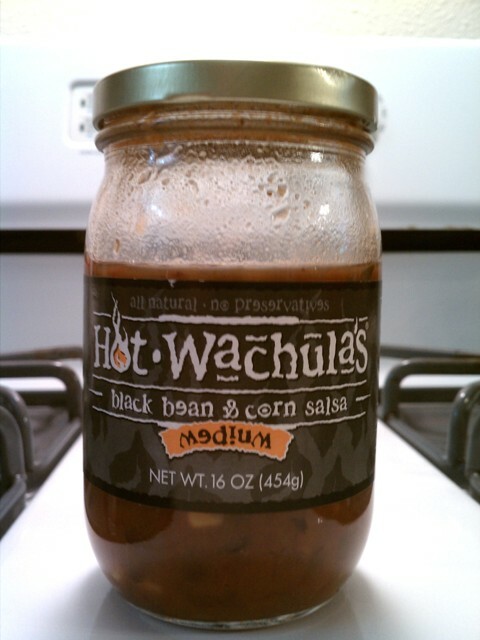 The Black Bean and Corn Salsa made by Hot Wachula’s is great. Like the Peach Salsa, you get a medium thickness, but plenty of texture. It comes in mild, medium, or hot, like many of Matt’s salsas, and I went with the medium version for this review. On the plate, it’s easy to see the mixture of black beans, corn, chopped tomatoes, fire roasted red peppers, jalapenos, onions, and garlic. As you can see, the base of the salsa is on the thin side, which is a nice change of pace in a black bean salsa. Normally, the body of the bean adds a little too much of a starchy base for me. Not so with this product. 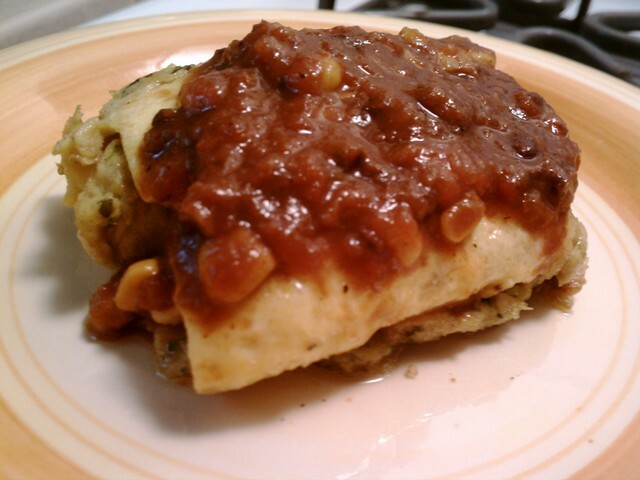 At Matt’s recommendation, we tried this salsa on a batch of my signature folded over eggs. I basically make a slightly browned omelet and fold it over to provide a nice fluffy bite. Throw in a little Hot Madras Curry and man, are they good. We topped the eggs off with the salsa and man… the combination of sweet, spicy, and tang (from the vinegar and lime) played off the eggs very nicely. If you’re up for a new salsa variety, head over to the Hot Wachula’s website. The best way to order his stuff is to just call him up and give him your credit card over the phone. He’ll ship it right out to you. Nice review, Kevin! I really like Wachula’s labels and fonts. A funky, yet very Mexican / Southwestern look to them. Marilyn is the black bean and corn salsa fan in our house. I would of course have to try the hotter versions right off the bat. 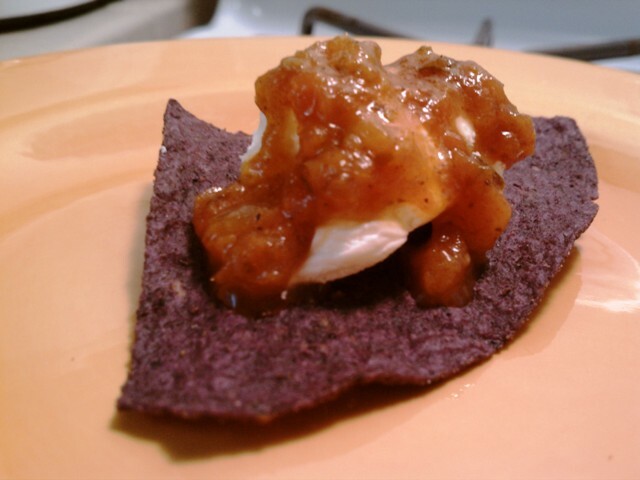 OK, you got me on the peach salsa, piled on the cream cheese and tortilla chip – this looks like the next party appetizer for me! As for the black bean and corn salsa, Brian is correct, I have no aversion to veggies on my plate, and it looks like this one avoids the starchy, thick texture that others have. Great review, Kevin, thank you so much! Thanks, Brian and Marilyn! Matt does good work. Marilyn, yes – do try the chip/cream cheese option! Makes a nice appy! Brian, I’ll see if I can get a HOT version of the peach salsa and send it up your way! I like the black bean one. It would be great on all kinds of fajitas, enchiladas and Southwestern stuff I like.